HISTORIANS refer to 1905 as Einstein's Annus Mirabilis (miracle year). He published four astonishing and remarkable papers that altered our perceptions of the universe and started a revolution in physics, chemistry and astronomy. Such a profound revelation was unprecedented in the history of science. Ask anyone to name a physicist and the answer will likely be, "Einstein," a name associated with genius, but the humble Einstein who produced the seminal brainchild was slow as a child. 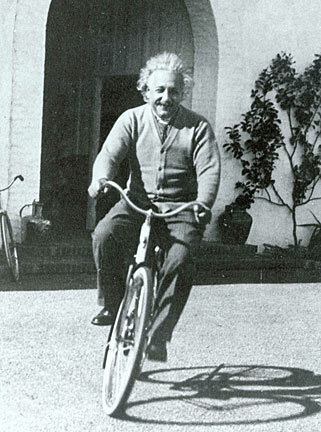 Albert Einstein theorized that time flows at different rates depending on how fast you are moving. He spoke for the first time at the age of 3, but in complete sentences. As an adult he reflected that he just didn't have anything to say until then. Teachers told his parents not to expect too much from young Albert, who showed little promise of exceeding mediocrity. He always talked slowly, pausing to form a complete sentence in his mind before speaking. Even in old age he would ask others to speak slowly because he did not grasp things quickly. Despite appearances, he had a brilliant curiosity about nature, aroused by the magic of a compass given to him at the age of 5. He was in awe of the some invisible force that controlled it. He had an unusual ability to grasp difficult mathematical concepts, and by the age of 12 he taught himself geometry and by age 16 had mastered calculus. At 16, Einstein wondered what a light wave would look like if you were moving along with it. He daydreamed and puzzled over it for 10 years before he finally articulated the special theory of relativity. In 1905 he was an unknown clerk in the patent office in Bern, Switzerland, when he published four masterpieces that would alter our perceptions of space, time, matter, and energy. On March 17 he sent a paper to "Annalen der Physik," the leading German physics journal. It was titled, "On a Heuristic Point of View Concerning the Production and Transformation of Light." It showed how light interacts with matter as discrete, independent particles of energy, contrary to Maxwell's revered electromagnetic wave theory. Maxwell treated light mathematically as a mechanical wave, modeled it after the motion of a spring. Waves of electricity and magnetism traveled through visibly transparent space that was filled with an invisible, electromagnetically elastic ether, as yet undetected. As mechanical waves, light should behave the same as other matter in motion, and the speed of the waves should depend on the speed of the source and the speed of the observer. Precise experiments failed to detect any change in the speed of light regardless of the direction or speed of motion of the experimental apparatus. A few years before, Max Planck had proposed a similar discreteness in the interaction of energy and hot objects. He had to invent the quantum of energy as a mathematical device to make his equations describe consistently the way hot objects emit and absorb light. On May 10 Einstein sent "Annalen der Physik" another paper, "On the Movement of Small Particles Suspended in Stationary Liquids Required by the Molecular- Kinetic Theory of Heat." Biologist Robert Brown had observed the random dance of microscopic particles (called "Brownian Motion") in 1827, and it remained an unsolved mystery. The kinetic theory of matter explained heat as an effect of the perpetual and agitated motion of atoms. Einstein used a new mathematical method (statistical mechanics) to predict the amount of motion of the particles and proposed an experiment to test it: Measure the random, jittering dance of microscopic particles suspended in a liquid from bombardment by the irregular motion of the liquid's invisible atoms. His predictions were soon verified. In this one masterpiece, he had reinforced the kinetic theory, created a powerful new tool for studying the motion of atoms, and convinced most remaining skeptical physicists of the existence of atoms. Riding a beam of light still commanded his thoughts, though. He was frustrated at his inability to rationalize the apparent incompatibility of Newtonian mechanics and Maxwell's equations, the two pillars of physics. Either one or both were incorrect, or there was a way of reconciliation. Newton defined the physical concept of absolute space and time in the 17th century: "Absolute, true, and mathematical time, of itself, and from its own nature, flows equably without relation to anything external. ... Absolute space, in its own nature, without relation to anything external, remains always similar and immovable." By mid-May Einstein was depressed, having pondered the conundrum arduously for a decade. One day, totally exhausted after a long day discussing it with good friend Michele Besso, he announced that he was defeated and would give up on his mission. THEN IT CAME to him in a flash of insight. Newton was wrong about space and time, and Maxwell's wave nature of light was incomplete. The answer was simple and elegant. Time flows at different rates depending on how fast you are moving, because light always travels at a constant speed, regardless of the state of motion of the emitter or the measurer. This unites space and time into a malleable "spacetime" that depends on one observer's state of motion relative to another. He worked feverishly on it to be sure that the equations were correct. Finally, he gave his wife Mileva, also a physicist, 31 scribbled pages of manuscript to check for errors. Then he slept for most of the following two weeks. On June 29 he sent the paper to "Annalen der Physik" with the title, "The Electrodynamics of Moving Bodies." Later, it was called "The Special Theory of Relativity," or STR for short. It was "special" because it applied only to observers in inertial motion (in a straight line at constant speed). In Newtonian physics, a "principle of relativity" states that measurements of mechanical processes cannot distinguish between a state of rest and inertial (unaccelerated) motion. Einstein had long been convinced that the principle of relativity applies to all phenomena, although light does not obey it. After finding the key to reconciling mechanics and electromagnetism, he deduced a remarkable consequence of special relativity. If an object emits energy, then its mass decreases by a proportionate amount. ON SEPT. 27 he sent another paper to "Annalen der Physik" titled "Does the Inertia of a Body Depend upon Its Energy Content?" wherein he derived the equivalence of mass and energy. This is now expressed as the famous "e equals mc squared" equation. Energy and matter are different manifestations of the same thing, related to one another by a factor of the speed of light multiplied by itself. Having established the axioms of relativity and the constant speed of light, he then reasoned that the principal of relativity must also apply to accelerating reference frames. This suggested that light would be affected by gravity. Another decade passed before he could embody the complex mathematics to describe it. In general relativity (GTR), he incorporated accelerated reference frames and formulated gravity as a consequence of distorted spacetime, not as a mysterious "force at a distance." Using his massive equations he calculated the degree to which starlight would be passing near the sun. He became an overnight sensation when his prediction was verified during a solar eclipse in 1919. Einstein attributed his genius to his slow development. He said, ". . . my intellectual development was retarded, as a result of which I began to wonder about space and time only when I had already grown up." All of this was spawned by a humble genius who felt that he should have been a plumber, and who said of himself: "I have no particular talent. I am merely inquisitive. It's not that I'm so smart, it's just that I stay with problems longer."